Look, I made my first quilt – awesome!! I feel so accomplished! 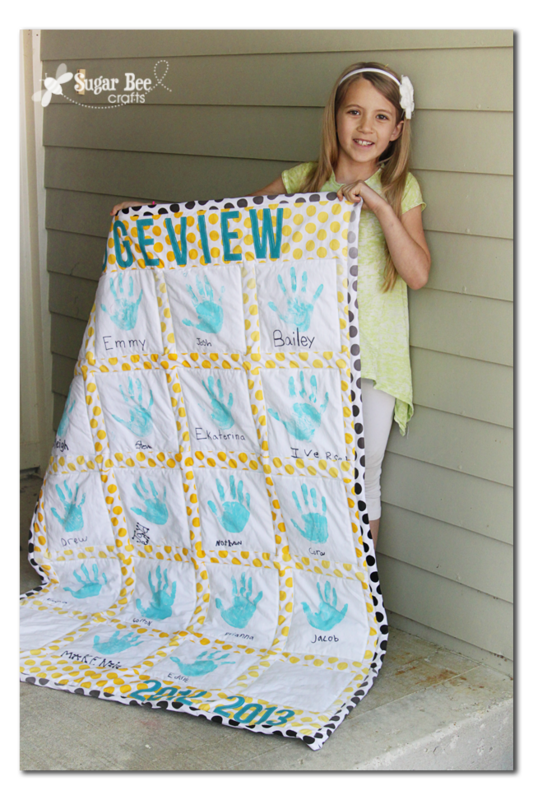 It was all straight lines, so the Handprint Quilt – Teacher Gift was pretty easy for a newbie to put together. 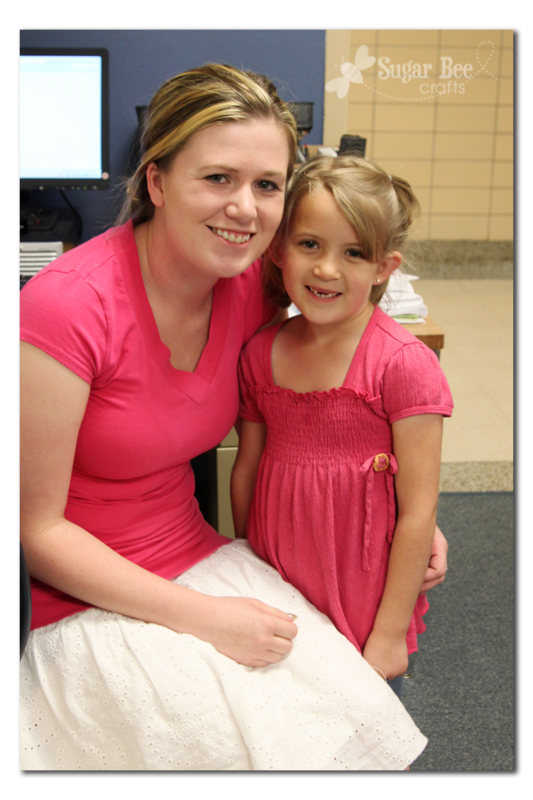 It was my kindergartener’s teacher’s first year teaching. I thought we needed to get her an extra-special end-of-the-year teacher gift. 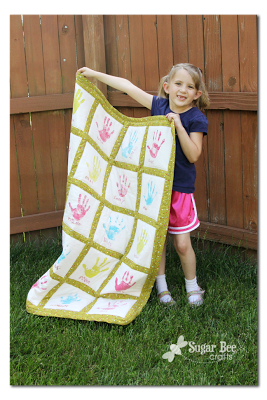 Then I read this great post on Kristen Duke Photography – her daughter’s kindergarten teacher was a first year teacher as well, and Kristen gave a great tutorial on making a quilt (follow the link for the tutorial). I knew that’s what I wanted to do! UPDATE: I made another one!! 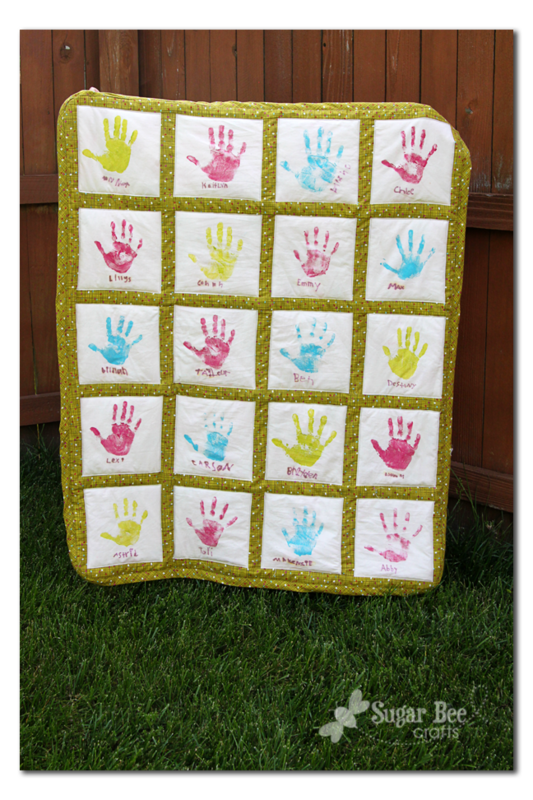 Check it out, Handprint Quilt, take 2! I didn’t mind the task of sewing, but collecting the handprints, money, etc, sounded like a big task. Luckily several other of the moms were on board and were SuperStars in getting the handprints. We asked each family to chip in a few dollars, and the collection covered all the cost. I absolutely LOVE this fabric – – very fun and kindergarteny, yet it’s apples, so that sticks with the whole “teacher” theme. The green fabric coordinates with the apple fabric. I picked them both up at JoAnns. I made my own blanket binding (large bias tape) using the tutorial at MADE. She invited them all to come back and visit her year after year and compare their handprints to see how much they’ve gone – – so fun!! And since I was there, I snapped a quick picture of my daughter with her teacher – – it was a great year! « Little Lizard King Patterns – – giveaway! That is absolutely beautiful! What a GREAT gift! Best teacher gift ever! I was a teacher before staying home with my boys so I have to know where you found the apple fabric? It is amazing!! I agree, that’s the best teacher gift ever!! You are awesome!!!! THat looks wonderful! 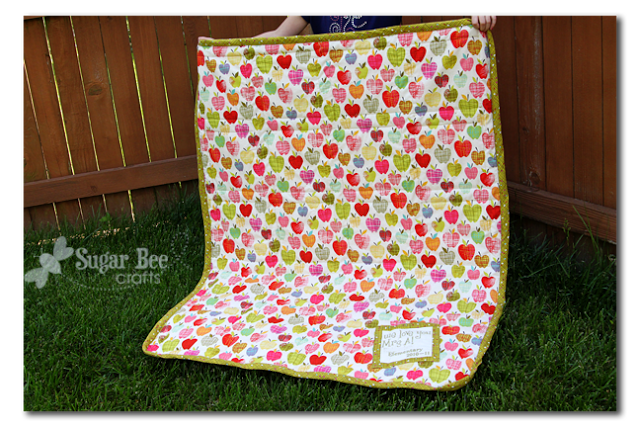 Thanks for sending me the link….LOVE LOVE your apple fabric (not so primary colors) and the square on the back is a really cute touch! Love the fabric! Cute teacher gift. What a sweet idea!!! So cool to make her something so special after her first year! 🙂 Love it! This is SO super SWEET! What a thoughtful gift!!! That is a great gift! I’m sure she loved it. Great and unique gift. 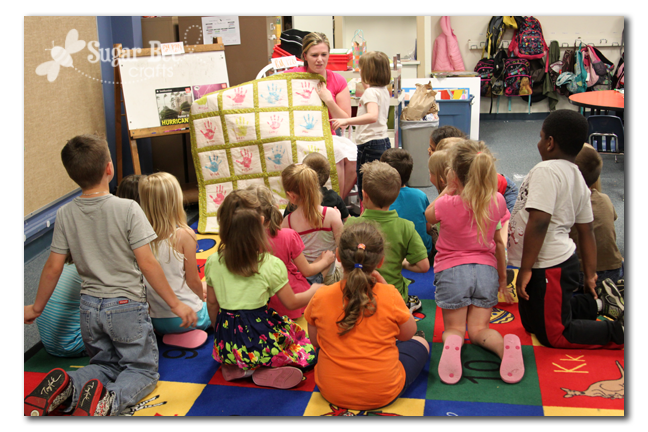 Lucky teacher – a memory quilt to remind her of her first year forever. What a precious gift that I am sure she will treaure for years! You did a wonderful job! I can only imagine how touched she was! Best teacher gift ever! That is coming from a teacher. I would love to get something like that from my students. What a fantastic idea! You did a great job. It seems like it will find a good home where it will be appreciated. Well done! 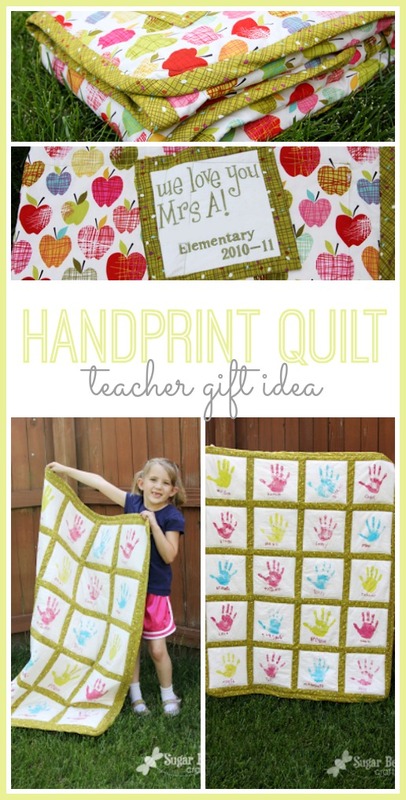 A perfect teacher gift, especially paired with those apples on the back! This is such a cute teacher gift!! Good job!! What a sweet idea! It really looks lovely. This is such an adorable idea! I featured it on my blog today!! LOVE that backing fabric! great job! It’s beautiful – love that apple print you used as the backing. Such a wonderful gift. Oh my gosh, that is the sweetest gift! 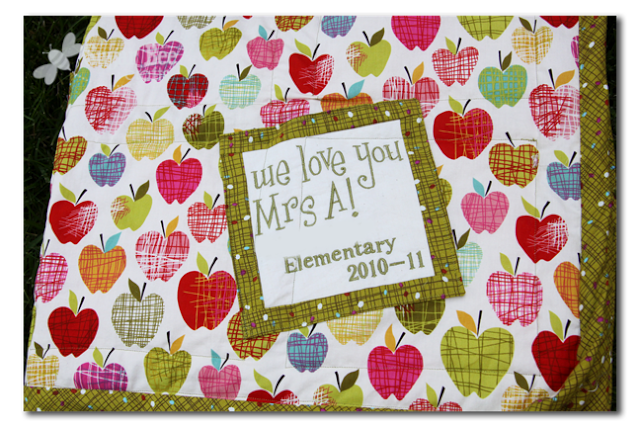 I LOVE the fabric you chose too, the apples are perfect for teacher, but the colors are awesome! 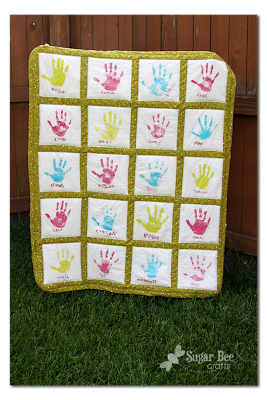 How sweet to have all of their handprints on it too! So sweet! 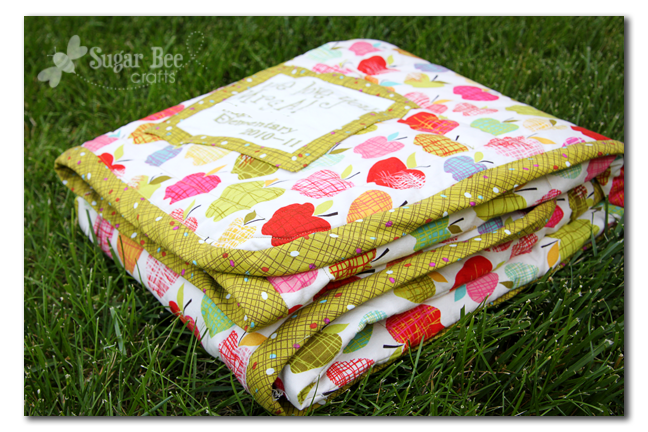 I can’t believe this is your first quilt! You did an awesome job! I found mine at Michaels – good luck with yours! I LOVE this! It’s my daughter’s teacher’s first year too! Just curious, do you remember how much fabric you used? Also did you cut out fabric letters and sew them on?? Thank you! !